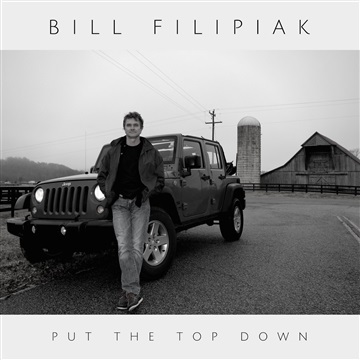 "Put The Top Down" is the debut album from singer/songwriter Bill Filipiak and represents over 25 years of writing. "Top Down" takes the listener through a variety of Americana styles including acoustic blues, country jazz and folk. Bill's writing on "Put The Top Down" focuses on the journey of life and the experiences that connect us all. At 52, Bill has experienced a great deal through his career and life and those experiences are self evident in his writing. From struggling with life's stresses at 3 am in the morning, to the harsh realities of divorce, to the bliss of finding new love, Bill writes from the heart and connects with his listeners through commonality. Musically the album features some of Nashville's finest and the sparse production of the album brings the listener into a room of musicians in a casual inviting way. "Put The Top Down" proves once again that sometimes less is more.